What Is Your Payback Period and How Does This Affect Your Revenue Growth? Figuring out the best metrics to use for your SaaS KPIs can be a difficult task. Many companies spend their time searching for a “wonder metric” that rises above the rest to provide a flawless top-down view of their business. Unfortunately, that metric does not exist. There are, however, some metrics that come close, allowing you to simplify your operations while providing an in-depth look into the health of their business. It’s no secret that at OpGen Media we work with SaaS companies of all sizes. In our work with these clients, we’ve come across all kinds of metrics to measure campaigns, including Lifetime Value (LTV), Sales Qualified Lead (SQL) ratios, and Customer Acquisition Cost (CAC)-based metrics. You name it, we’ve seen it. Over time, we’ve seen these trends come and go. There is not, and will never be a be-all end-all metric for SaaS companies. There are just too many important variables to account for. There is, however, one metric that we have consistently seen today’s emerging SaaS players consistently gravitate toward —CAC Payback Period. What is CAC Payback Period? 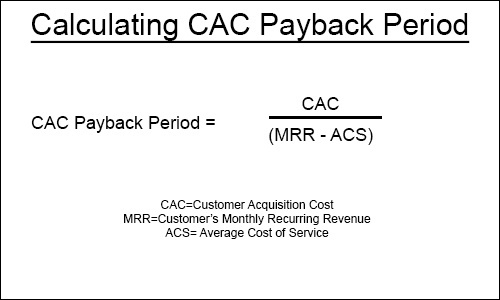 CAC Payback Period is defined as the time it takes a company to recoup the amount spent in acquiring a new customer. If it costs you $50 to acquire a customer, how long will it take you to earn that money back? Remember that most SaaS companies see gross margins between 85-90 percent. A company with a $10 subscription service would need a little less than six months to recoup their investment, while a company with a $25 subscription service would only take a little over two months, giving the second company a lower (healthier) CAC payback. CAC Payback Period has risen in popularity because it’s a simple metric that touches many areas of your average SaaS business — lead generation, advertising, pricing, retention, sales & marketing salaries and churn all play a critical role in CAC Payback. It’s not perfect, but it is a well-rounded metric that provides straight-forward insight into the health of a company’s cash flows and their business model. The graph above shows the revenue/spend on the Y-axis, and time on the x-axis. As time goes on, the customer drives more revenue, paying back more of the money that was spent to acquire them. In the red, the acquisition of the customer is still under water based on their acquisition cost. In the green, their acquisition has become profitable. The point at which they intersect is when the revenue from the customer has officially paid back the acquisition cost. This number, which is typically tracked in months, is the CAC Payback Period of that given customer. Part of the reason for CAC payback period’s rise in popularity is because of how simple the metric is to calculate. To calculate the Customer Acquisition Cost, you simply divide your sales and marketing expenses by the number of new customers acquired as a result of those campaigns. However, one important thing to remember when calculating CAC Payback Period is that you must use gross margins rather than topline revenue to ensure accuracy. Ben Murray has an excellent post here on how to calculate your CAC payback period that is definitely worth your time. CAC Payback Period is simple and easy to calculate. It also favors measurable cash over future projections in the way that Customer Lifetime Value and other similar metrics rely on. This is ideal for bootstrapped companies or companies focused more on their bottom line than their top-line because it places the focus on producing measurable revenue in the present, rather than relying on projections. Often, we find that businesses that rely heavily on LTV find that their LTV may underperform expectations over time, or put themselves in a difficult cash situation if their equations fail them. 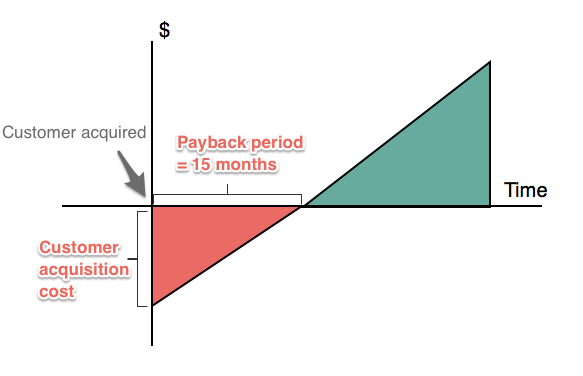 Using payback as your main metric is a signal that you value risk mitigation vs. overall return. That in itself is neither a good or bad thing, but rather something that depends on a variety of factors within your business. Dave Kellog illustrates this perfectly in this article. You’d be hard-pressed to find a metric that is so simple to calculate, while providing the same level of depth and insight. In addition, it is imperative to build a payback period model based on each channel, or type of channels, to ensure this metrics is accurate from a marketing perspective. If you do not separate your paid and organic leads and closed business, you’ll end up with an inaccurate numbers which can negatively influence your marketing spend and conversion rates. How Does CAC Payback Affect Revenue Growth? CAC Payback Period can be a very telling metric. It highlights a number of important operational aspects while condensing them into a single metric that is easy to track and calculate. Payback period first and foremost highlights the effectiveness of your customer acquisition strategies. Your ability to acquire customers is one of the most important parts of your business, responsible for driving revenue and facilitating growth. The quality of the customers that you acquire and the amount that you pay to acquire them have a larger effect on your bottom line than any other aspects of your business. The shorter your CAC Payback Period, the more effective your acquisition methods are. By tracking the CAC Payback of each channel individually, you’ll shed light on which channels are the most effective and provide larger or more stable returns on your investment. Customer acquisition cost. How much are you paying to acquire each individual customer? Subscription SaaS companies assume the risk of paying to acquire customers up front and replenishing their reserves over time. Higher acquisition costs mean that it takes you longer to “break even” on the acquisition of each individual customer. Package pricing structure. How much, and how often do your customers pay you? SaaS companies that only offer yearly packages are likely going to have very low payback periods because customers are paying larger amounts in a lump sum. Monthly plans may take longer but typically come with shorter sales cycles. Reducing your CAC Payback Period is instrumental in the growth of any SaaS company. Short payback periods often mean that your company is able to avoid unnecessary debt and allocate more investment towards growth. Payback periods that exceed the one-year mark are common among the largest or well-funded SaaS companies in the world — but they have the cash reserves to sustain those numbers. Smaller companies without VC money will almost always need to recoup their investment in a much shorter timeframe to remain financially healthy. It’s also worth noting that when you’re just starting out, your CAC cost may be extremely high due to upfront costs, but with some reasonable growth your metrics should all even out. Focus on low-cost organic acquisition. If you can reduce your customer acquisition cost by bringing a larger portion of leads through organic channels, you put yourself in a position to reduce your payback period. Build out processes to facilitate search engine traffic, referrals, and word-of-mouth marketing. This also allows you to spend more aggressively on the outbound side if done right, which may seem contrary at first. Increase revenue per customer. If you want customers to pay back their acquisition cost more quickly, the other option is to simply get more money out of them by providing more value in return. There are a variety of ways you can do this. You could raise the pricing of your packages if you are underpricing. You can also focus on up-sells and cross-sells to improve their lifetime value. Lead Nurturing. Sales & Marketing are known to have disagreements over lead processes. But one thing is certain - it’s incredibly important to convert the leads you do have, even if they take longer to close, which is common in outbound lead generation. Plus, averages are just averages. Each deal is going to be unique in some ways. CAC Payback Period isn’t a perfect metric. There are always pros and cons in choosing metrics for your KPIs. Plus, it really does depend on your company’s goals and current cash position. Where payback period does shine though, is in providing a well-rounded view at your most important revenue-driving mechanisms. The amount that you pay to acquire a customer, and how long it takes you to break even on that acquisition represent the foundation for a growing and healthy SaaS business. Focusing on payback puts your organizational focus on both bringing in new customers and growing revenue from the customers that you already have. It is simultaneously a “big-picture” metric while providing very specific insights into your operations. The industry has shifted toward using CAC Payback as a defining metric for SaaS company health. The efficiency in which companies acquire customers and grow the value of those customers speaks to the efficiency of their operation as a whole. If you aren’t already using CAC Payback Period, you should start today.